NSTEMI is a type of heart attack. NSTEMI stands for Non-ST-elevation myocardial infarction. Sometimes an NSTEMI is known as a non-STEMI. 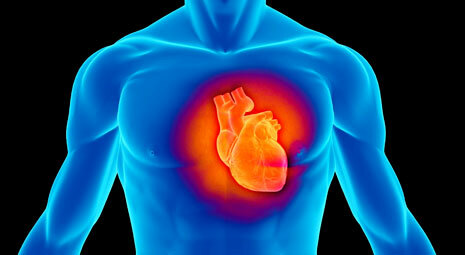 A myocardial infarction is the medical term for a heart attack. ST refers to the ST segment, which is part of the EKG heart tracing used to diagnose a heart attack. How is a NSTEMI diagnosed? In addition to signs such as chest pain, a heart attack is diagnosed mainly through 2 ways. Firstly is a blood test that shows elevated levels of certain markers of heart damage such as cardiac troponin. Secondly is by looking at the EKG heart tracing. If there is a pattern known as ST-elevation on the EKG, this is called a STEMI, short for ST elevation myocardial infarction. If there is elevation of the blood markers suggesting heart damage, but no ST elevation seen on the EKG tracing, this is known as a NSTEMI. NSTEMI may be associated with other EKG changes such as ST segment depression. Often looking at the EKG helps us to locate the area of the heart that is affected. Once NSTEMI has been suggested, a cardiologist who can help determine the risk and the treatment strategy will typically see a patient. An echocardiogram may be ordered to look at the heart functioning. 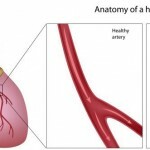 Initially, blood-thinning agents will be given such as aspirin and the blood thinner heparin. These medicines have been proven to improve outcomes in patients with NSTEMI. There may be other medicines given such as a beta-blocker or nitrates. Many patients will then go for a test known as an angiogram also known as a heart cath. This test involves injecting dye into the heart arteries to look for blockages. In the case of severe blockages such as a widowmaker treatment in the form of a stent may be required. 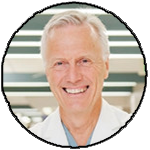 Sometimes there are so many blockages that bypass surgery is advised. A NSTEMI is a heart attack, so the treatment of that applies. Medicines are prescribed that have been proven to save lives in the long term for heart attack sufferers. Depending on factors such as symptoms and heart function, a number of medicines may be prescribed. Lifestyle changes and modification of risk factors is key in preventing recurrence. It is important for smokers to stop smoking. Blood pressure control and control of diabetes are key. A post-heart attack exercise plan should be incorporated into a daily lifestyle if possible. Often NSTEMI patients will be sent to cardiac rehab to receive education on the important of exercise and begin a program in a supervised environment. Why Does My Hospital Discharge Paperwork Say NSTEMI But No-one Told Me About a Heart Attack? Part of the way of diagnosing a NSTEMI is by a blood test called troponin that is indicative of heart damage. Although the troponin test is great in that it does not miss heart attacks, it is not specific for heart attacks alone. Basically, there are other problems that can cause an elevated troponin level. Many patients with critical illnesses, infections and kidney disease among many other conditions can have an elevated troponin that is not related to heart blockage. In these cases, although sometimes it is labeled NSTEMI, there is no concern for underlying critical heart blockage. These antiplatelet agents thin the blood preventing further heart attacks. These are often given for a year after heart attacks and sometimes longer. 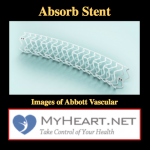 When a stent is placed, it is important to ensure these medicines are not stopped until advised by a doctor as they help prevent clotting inside the stent. These agents slow the heart rate down and reduce the amount of work the heart has to do. These medicines can help reduce enlargement of the heart, and control blood pressure and are proven to be beneficial with regard to outcomes after a heart attack. When there is heart muscle dysfunction, these medicines may strengthen the heart and prevent further deterioration. A variety of blood pressure medications may be used to control high blood pressure, a risk factor after a heart attack. If there is heart muscle dysfunction and heart failure, a drug called Spironolactone (Aldactone) may be added to help prevent further deterioration and to strengthen the muscle. If there is persistent chest pain after the attack and initial treatment drugs called Nitrates (Imdur) may be added to provide relief. 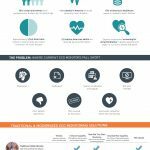 STEMI vs NSTEMI – Which is Worse? The bottom line is that both are just as bad. STEMI is seen as more of an immediate emergency because there is a known total occlusion of a heart vessel that needs opening back up urgently. In terms of long-term outcomes, they have equal health implications. Patients with NSTEMI often have other illnesses such as ongoing critical illness, diabetes, kidney disease, and other that means they have a generally high risk over the long term. Both STEMI and NSTEMI need aggressive treatment over the short and long term. Thank you very much for your kind words and we greatly appreciate your viewership. My 16 year old son has been in and out of ICU for the past year with elevated Troponin I levels, Troponin has gotten up to 0.606. 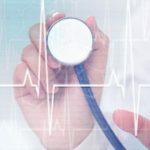 Doctor can’t seem to find the answer for the chest pain and elevated Troponin… He’s had several imaging done, all kinds of genetic testing and so far we still don’t have an answer to his issue. Can there be anything else causing his chest pain and elevation of Troponin? I am so desperate for answers. Any help will be greatly appreciated. My son was in ICU WITH TRIPONIN LEVELS OF 11.O his hands and feet were very cold and wet,he had horrible chest pain also. This was one month ago. The cardiologist said it was probably due to virus. ?? What did the echo show? Your son is having N Stemi heart attacks.I know he is young and this is why doctors are reluctant to give this diagnosis.an angiogram will show no blockages and his EKG will show depressions instead of elevations.Ask for an echocardiagram and it will show he has heart damage from his heart attacks.Tell your doctor to look at N stemi heart attacks. Thank you I feel more reassured after reading this, my son has just been discharged from hospital after the diagnosis of Nstempi he did have a angioplasty and was discharged next day. look up Takatsubo Cardiomyopathy. Also, for young people, cocaine, meth and alcohol and some prescription drugs such as Adderall can precipitate a NSTEMI. Viruses can also cause cardiomyopathy and pericarditis. Thank you, my dad suffered from this and the information was very helpful. Very helpful. My brother is in hospital with pancreatitis, and had a NStemi, so I wanted to know the basics of it, so we could ask the right questions. However I was experiencing a sharp pain radiation from my heart out to the end of my toes and finger tips. It was like a electric shock. My GP. Hasn’t said any more about the shooting pains. Look at your medications and their side affects. Also the medicine you are taking might be counteracting each other.it sounds like too much. Today morning I was feeling pain in my right side chest after having my shower then went and consulted Dr as per is advice did test for Cardiac Troponin I Result is 0.01 ng/ml – Diagnobstic cutoff 0.30 ng/ml. Pls advice the above are normal or should I consult the Doctor. Always see a Dr in these circumstances regardless of the test values. I was sorry to read that most of the symptoms of a heart attack were described as chest pain. It has frequently been documented by many women that had heart attacks that they did not have chest pain. I had bilateral shoulder pain and upper back pain with a Troponin level of 1.72 and was told to go to the ER. Women need to be educated to NOT wait for chest pain if they are experiencing other symptoms, but to call their doctors. What do you think? It remains that chest pain is the predominant symptoms, but atypical symptoms are much more common in women. There is a strong active education movement regarding that. You are so right. I was being treated for a narrowing esophagus, felt like something sitting in my throat, pain in my back, neck and shoulder. My troponin was 0.58 first check. Women need more education. If I had known more I would’ve made it to emergency room sooner. Correct medicines, blood pressure control, diabetes control, stop smoking, exercise, diet, lifestyle, cholesterol medications. I have COPD. I was sent to hospital when I had a severe COPD exacerbation. Whilst being transferred to ward and hospital bed, I suffered a severe shortage of breath, lasting ten minutes. They put me on a nebulizer. When I saw the cardiologist the following morning, he said I had had a heart attack, and xrays showed I had had a heart attack sometime in the past. Due to the condition of my heart and the COPD, he said he was unwilling to put in a stent or risk doing anything to my heart. I was still suffering from a shortage of breath, but I my wife had brought me my COPD medication, and the doctors started me on a prednisone treatment. My breathing gradually improved, and I was discharged. Eight weeks after that I had an evaluation of my condition, and although no tests were taken, I was told there is nothing that can be done for me. When I asked what sort of exercises I could do, I was told just to take it easy. I recommend you consider a cardiopulmonary rehabilitation program, you’ll find it immensely useful. Thank you doctor. My pulmonary nurse has arranged for me to attend a pulmonary rehab programme in the New Year. I write this to let you know you’re not alone and neither am I. In reviewing the information you have presented, I found it to be more than helpful. It was written so even if you are a layman, you can comprehend the concepts. My husband is 59 had an NSTEMI in November. He is in cardiac rehab and is doing fine. He has been off work since and is anticipating going back to work soon. His rehab therapist advised him that his snow shoveling/pushing days and exerting himself outside when it is below 30 are over. Unfortunately, his job requires him to work in cold temperatures and to often dig and shovel in the snow. He is very fortunate that his employer has excellent sick benefits that would allow him to take off work until the cold weather has subsided. I do not want to put him at risk and he plans to retire before next winter. Are his risks too high at this point to go back to work under these conditions? His cardiologist is on vacation so he doesn’t know if the cardiologist will write him off for the time needed. If not, we are considering his options for retiring early, but that is not our preference. Hi Kelly, i understand these are important questions however without knowing his specific case and the details of it i don’t think i can safely answer that. I am a 74 year old female with a history of mild hypoaldosteroneism and mild adrenal (cortisol) insufficiency, meaning in my case at least, my adrenals produce low range normal cortisol but do not respond to stress testing. I take very low doses of a fludrocort and hydrocortisone replacement. I had an emergency double bypass in April. The dreaded widow maker. Recovery was normal. Two months after the bypas the car I was driving was hit on the left (driver) side of the vehicle. It was weakened by steroid treatment. It has been about two weeks post stent. I still have mild shortness of breath and a sense of mild chest tightness on climbing stairs or exercising. Any suggestions, thoughts or opinions would be appreciated. Thank you for any comments or suggestions. I had an emergency double bypass in April. The dreaded widow maker. Recovery was normal. Two months after the bypas the car I was driving was hit on the left (driver) side of the vehicle. Some cervical and thoracic strain. Scarring is not common and early graft failure is well described but not common. When they did your angiogram they would have looked at the other grafts and if there was no problem seen that is at least reassuring. The meds taken for the adrenal issue are not likely to be related to graft survival. Should a NSTEMI be visible on a 12 lead ECG? It depends from case to case. 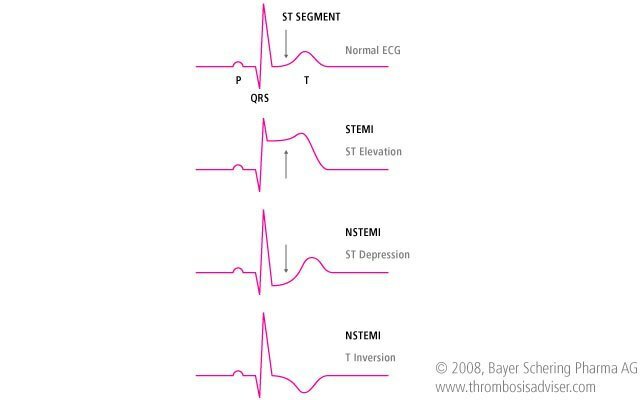 In some NSTEMI there are changes such as ST depression or T wave inversion that are suggestive of ischemia. There are many cases however where there are no obvious EKG changes. I had bilateral pulmonary embolisms and a NSTEMI and echocardiogram shows enlarged right side of heart. Cardiac cath shows coronary arteries are 80 to 85 percent clear. My follow up with my primary care physician says i don’t need to see a cardiologist at all. And refused to give me a referral. I live in Port Charlotte, Florida. She blames Medicare for the way i am treated for my healthcare. I have no clue how to deal with this doctor but i know she will end up killing me if i stay in her care. I had a severe chest pain in Jan.2015. Subsequent to admission in ICU several blood tests and other tests were done. Echo showed a good systolic function =60%. Angio done and blockages at LCD and LCX were detected ranging from 90% to 30%. Angioplasty was done and two DES were placed. Till date I am under medical supervision. The diagnosis was NSTEMI, Ischaemic heart disease and double vessel disease. Presently I am on Eltroxin, Deplatt CV 20, Telma 40 and Rabirite D. How can I know the condition of my heart. I am a retired Govt. officer aged 62 +. Just spent two days in the hospital after a nstemi. Elevated troponin. Chest pain difficulty breathing, left shoulder, right jaw, upperback pain. Mild nausea and stomach cramp. Don’t fit the profile for a heart attack, 58 female but no bp issues, or any other conditions such as diabetes -active every day, very healthy. Vegie/Mediterranean type diet, healthy weight etc ect. Angiogram and echo show healthiest heart and vascular system on the planet. Doctors mystified. Only reason I can come up with is stress for the last 20 months due to deaths, illnesses back to back in family members, mother moving in with us, helping her get her limited finances in order and her health (she has some sort of heart issue we have been in the process of trying to figure out- I actually had my attack while leaving hospital after she completed her stress test!!) plus a major work transfer for my husbands job among other things involving frequent stressful travel. Can stress have been the trigger? What are the chances of another attack? Docs say and I agree, no need for any med because all my values such as cholesterol tryglycerides are excellent. What the heck just happened to me???? Karen did u ever find out ? Thank you so much for taking the time to write these articles. Found this article VERY informative. Myself, having a NSTEMI at 48. LAD was 99% blocked that was able to be stented and the RCA is still totally occluded. This has resulted in 4 additional cardiac caths to attempt to open the RCA, but with no success. Non exertional angina has led me to be placed on Imdur and Ranexa, among the other meds that were given to me at discharge. My fear, is that with this blocked RCA, I can just keel over at any given time and that’s it for me? Is it possible to lead a normal life, within reason, like working as a truck driver, with this CTO? In general I would say that a CTO, in the setting of a stable condition is not necessarily life threatening, and when we treat them it is for quality of life rather than any other purpose. Medical therapy is most important, and if this doesn’t work then an attempt at opening the CTO is warranted. Im surprised its taken 4 attempts to open the artery. I suggest you go to a dedicated CTO center. In such centers we generally have the tools and techniques to make the majority of attempts successful. Once again, its not the blocked RCA that is the indication to stent, it would be persistent symptoms despite optimal medication. If you have no symptoms at all then medication may be preferred. Is morphin sulfat contrainddicated in NSTEMI ? And why ? It is often used as treatment for the acute period to treat pain. My husband is 47 he had 3 heart attack his diagnosis is 3 vessel CAA WO NSTEMI dislipidemi Htn , where his cholesterol is very high and the doctor is recommending him to do CABG. Does this is the only options for him to unclogged his arteries? What is the best thing for him at this stage he is on medications now. Of course i would have to see the images to comment specifically. In most cases of NSTEMI with triple vessel disease bypass surgery would be advised particularly if there is dysfunction of the heart or diabetes. I’m a 59 year old female – thought I was the picture of health. Thin, exercise, good nutrition. I landed in the hospital with a “vasospasm with resulting nstemi”. My test results were all normal – EKGs normal, angiogram normal, echocardiogram normal. The cardiologists believe this was brought on by Sumitriptan (Imitrex). Obviously I will stop taking that! They told me several times I did NOT have a heart attack, but it seems from what I’ve read, I did. I’m confused as to whether my diagnosis is the same as broken heart syndrome or something different. My troponin levels were elevated. The incident didn’t happen during any exercise – I was actually lying down looking at my iPhone. I called 911 due to severe jaw and left arm pain. How likely is this to happen again, if I stop the Imitrex? They told me my heart was in great shape and that there was no damage. Thanks in advance for any opinions or help. agree with stopping the imitrex, however how was the diagnosis of spasm made, did you have any st elevation at any time on the EKG? Hi sir my father age is 58 and his troponin t report was 11mg/L reference is 24 mg/L what does it mean?? 58 year old male. I’ve had a stent placed LAD at 90% blockage, the stent was then blocked at 99% about 11 months later (NSTEMI). So they stented the stent (with a drug-eluting stent like the first one). That was 3 years ago. Initially I was told I would be on a regimen of Effient (Prasugrel) and aspirin for the rest of my life (that was back in 2014). Now, I am hearing that there is evidence that the Effient medication has little practical benefit after about 6 months to 1 year, post stent placement. Some seem to suggest a Plavix/aspirin regimen after ceasing the Effient, and that the Effient is one of the more stronger medications that maybe shouldn’t be used long-term. Have you heard of this new evidence? The medical approach in this setting with careful consideration appears entirely reasonable. The meds are known to help. With regards to BP, the metoprolol in general has a fairly weak bp effect and so hopefully will not lead to issues. In general i have all my patients use home bp monitors, measure at least twice a day and keep a diary that can be taken at time of follow up visit and be critical in making treatment adjustments. March 5th I went to E.r because i was having pain in my elbows and arms and chest. Was hurting to swallow. I got to hospital at 11am and they took my Bp it was 160/119 and gave me ekg. They had me sit in waiting room until 1:15pm when i had my blood drawn and my troponin level was 0.53 ng. By 7pm my troponin level was 5.510ng and i got moved to the cath lab and had an echocardiogram and then had a heart cath done. To find out my Ef was 30% and i had a blockage in the middle of something they called the widowmaker. They put a stent in and said my Ef didn’t improve and kept me in hospital for 5 days and said i had to wear a Lifevest. I’m a 39 year old female that has been dealing with seizures for 2 years and trying to figure out where those are coming from and now i have this. Ive been put on brilinta,coreg,lisinprol and aspirin,lipitor. That’s on top of my Aptiom and Topomax i take. I’m a 60 to male. Last Sat, I had a severe pain under my left shoulder blade. Then it quickly moved to the front. Pain was unbelievable! In ambulance, they gave me 2 baby aspirin, then after an ekg, they gave me a nitroglycerin and the pain dropped to 6/10. The ER ekg result on line was “Normal sinus rhythm; Nonspecific ST abnormality; Abnormal ECG; NO STEMI”. Blood enzymes were consistently low, so they discharged me the next day. Stress echo was “Normal” yesterday. My cardiologist says no followup necessary. Do you agree? I feel I dodged a bullet with the nitro, but will I be so lucky next week or next month? The cardiologist will usually determine the risk level. I would certainly follow up regardless, at least once particularly if symptoms. Thank you very much for posting this article. I have found it a most useful starting off point for understanding my heart attack and subsequent treatment. Glad to hear it’s of use.